With three storms currently circulating in the Atlantic region, the Ministry of National Security today issued an Emergency Measures Organisation [EMO] update. 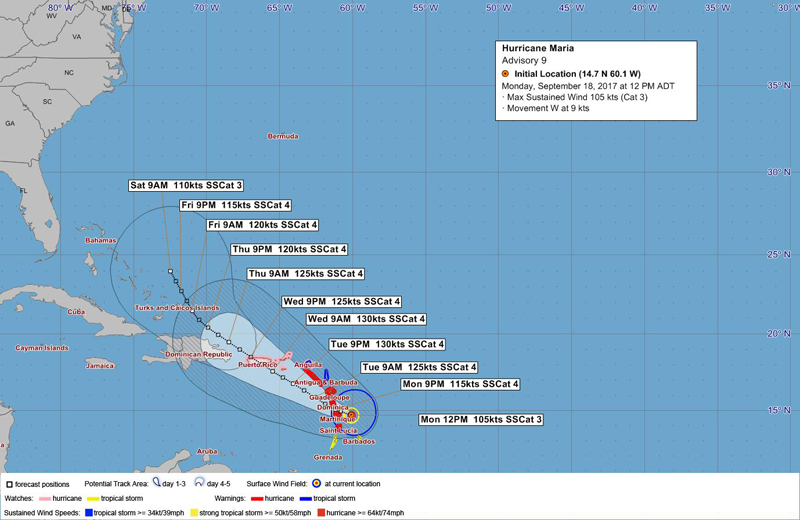 The Ministry said, “According to the Bermuda Weather Service [BWS] and the National Hurricane Centre [NHC] the midday advisory indicates that Jose is a category 1 hurricane. It is located 331nm WNW of Bermuda travelling North, away from the Island at 8 knots per hour. “Weather experts have noted that Hurricane Jose is ‘an unusual storm’, looping south of Bermuda and now forecast to loop north of Bermuda. And projected forecasts indicate that Hurricane Jose is expected to continue to turn away from Bermuda. This afternoon, the Minister of National Security and Chair of the EMO, Wayne Caines, said, “We must continue to exercise vigilance and preparedness as we continue to navigate through this hurricane season. “This is an extremely active time for us, and the EMO continues to monitor all of the weather systems making their way through the Atlantic. Minister Caines continued, “Both Hurricane Jose and Hurricane Maria are producing significant wave action, which is resulting in swells and dangerous rip currents. “We can expect this will last for the next few days. I want to stress that care and caution should be taken by individuals who are visiting our beaches. “As a measure of public assurance, the EMO has been kept regularly abreast by the BWS and the NHC and we will continue to closely watching these storms for any changes that may pose a threat to Bermuda,” Minister Caines added. The next weather update on Hurricane Jose, Hurricane Maria and Tropical Depression Lee will be at 6.00 p.m. The public can visit weather.bm for more information.